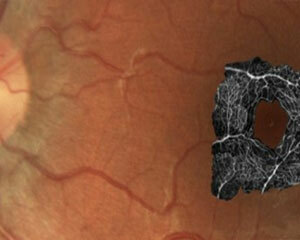 Image courtesy of Phillip Bedggood at the Metha Laboratory, Department of Optometry & Vision Science, University of Melbourne, Australia. Not all ‘scientific CMOS’ cameras on the market offer a choice of Rolling and TrueGlobal exposure. Most offer one or the other. Zyla 5.5 and Neo 5.5 offer both exposure modes. Zyla 4.2 offers Rolling Shutter and a Simulated Global Shutter mechanism. Global Shutter gives you the ability to closely emulate the familiar 'Snapshot'exposure mechanism of interline CCDs. This is an important consideration for many applications. For our work on quantifying red blood cell velocity in the retinal capillaries we elected to operate in global shutter mode, which produces minimally distorted images. When operating in rolling shutter mode we observed significant image warping, even for moderate eye movements. In Rolling Shutter, different lines of the array are exposed at different times as the read out 'wave' sweeps through the sensor. 10 ms is required at the start to ‘activate’ the sensor to expose, and then 10 ms is required at the end to readout the sensor. Use when not synchronizing to peripheral devices AND only when there is a minimal risk of spatial distortion from a slow moving sample. In True Global Shutter, offered in both Neo 5.5 and Zyla 5.5, each pixel in the sensor begins the exposure simultaneously and ends the exposure simultaneously. This provides a true ‘Snapshot’ exposure capability for moving samples that is both ‘photon-efficient’ and easy to synchronize to, especially critical for 3D / 4D microscopy. The ‘4T’* (4-transistor) design of the Zyla 4.2 sensor pixel permits more photons to enter, driving Quantum Efficiency up to 72 % (@ 580nm). The 4T design also means that it is fundamentally a Rolling Shutter sensor. However, a feature called ‘Global Clear’ has been implemented, which allows for a simulated Global Exposure mode, which requires TTL communication between the camera and a pulsed light source. The customer is highly advised to make an informed choice before purchasing, since in microscopy, the more photon-efficient True Global shutter approach can actually result in a higher signal to noise, faster frame rates and non-distorted images. True Global exposure in particular is viewed as an important mode for the biologist, as its benefits are deeply synergistic with the core imaging requirements of live cell microscopy. Simulated Global shutter is an exposure mechanism that can be accessed using Zyla 4.2, as a means to emulating the Global Shutter and avoiding possibility of spatial distortion when imaging moving objects. Note however that True Global Shutter is a more efficient mechanism. To access Simulated Global Exposure, the ‘FIRE ALL’ TTL output of the cameras is used to activate a pulsed light source to illuminate only during the phase of the Rolling shutter exposure cycle during which nothing is ‘transient’, i.e. the middle section of the above Rolling shutter schematic. 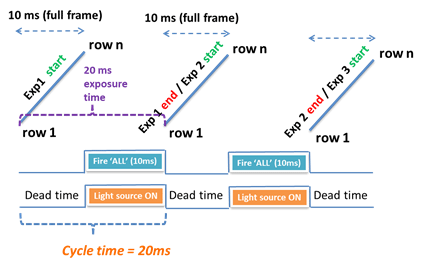 Achieving 50 fps with Simulated Global Shutter, using the Fire ALL TTL output of the Zyla 4.2 to activate a pulsed light source during the non-transient phase of the Rolling shutter exposure cycle, resulting in 50% dead time. Note, The True Global Shutter mode of the Zyla 5.5 and Neo 5.5 can achieve 50 fps with 100% photon collection and zero dead time, and does not require a pulsed light source. Please view the frequently asked questions article available in our learning center. To learn more about Rolling vs Global Shutter, please read the full Rolling vs Global Shutter technical note. Please read the Synchronizing to Andor sCMOS cameras technical note.